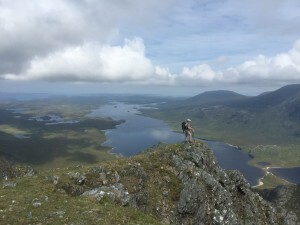 Last week Carol English and Vera Wealleans shared some of the high points of their Munros and Corbetts challenges, this week the ladies share their experiences of some of the low points, the Scottish weather and wildlife to name a few. Being in Scotland, the weather can be unpredictable, what were the worst weather conditions you have faced and how did they affect your walks? Both: There have been so many weather issues over the past 20 years! 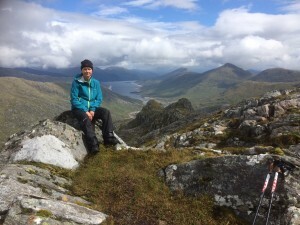 Carol: Wind was definitely the biggest issue, there were at least 3 Munros that we had to abandon and try again at a later date due to the high winds. Sometimes winds can reduce you to crawling to prevent being blown over completely. Vera: That is so true, we’ve even at times just had to stop and lay face down and wait until the wind eased up a little. When we climbed Ben Wyvis, the wind was so strong that when we arrived back at my car after the climb the windows had been blown out and we had to drive to Inverness with no door windows to have them replaced. 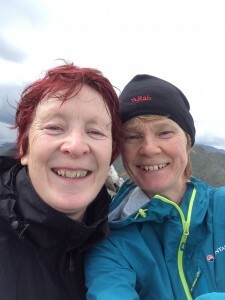 Carol and Vera were dependent on each other to stay safe while climbing the Munros. Vera: Its not always the wind that causes a problem, when you spend so much time in each other’s company you are well aware of their mannerisms, on one climb Carol seemed out of sorts and I knew instinctively that something wasn’t right. I believed Carol was suffering from heat stroke even though she insisted she was fine, I encouraged her to take regular sips of water and we took far more breaks than normal until we eventually reached our camping spot. The following morning when Carol was feeling a little more like herself she berated me for making her drink lots of water as she had spent most of the night taking toilet breaks, I knew she was feeling a little better! Carol: Sometimes it’s the cold that gets you, on many an occasion, we have had to help dress each other in more layers to try to combat the cold, on one occasion I had to physically help Vera back down a climb because she was so cold. Incidents like this really do highlight how dependant you are on each other during climbs. No doubt all of your climbs were not a walk in the park, what was the hardest obstacle you have faced during the walks? It wasn’t just the weather Carol and Vera had to deal with on their many trips to Scotland. Both: HIGHLAND COWS!!!! They are huge, their horns are scary and when they have their young with them they are incredibly protective and unpredictable. Vera: Much to Carol’s amusement, I have come a cropper with electric fences on a couple of occasions, they give you quite a shock! Carol: Vera’s Achilles heel is rivers, she is very wary to cross them and needs a lot of encouragement, as you heard earlier, I will give any river crossing a go. 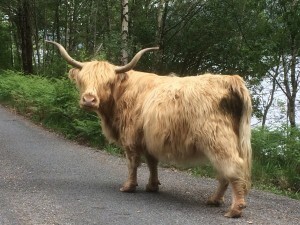 You have both been regular visitors to the clinic throughout your Munro and Corbetts challenge, does this mean you have picked up injuries along the way? Cycling was sometimes a challenge for Vera. Vera: I have had the odd slip on the Munros, I once fractured my wrist on a climb in the Lake District. I tend to get a lot of my injuries from cycling, either falling off or suffering with low back pain. 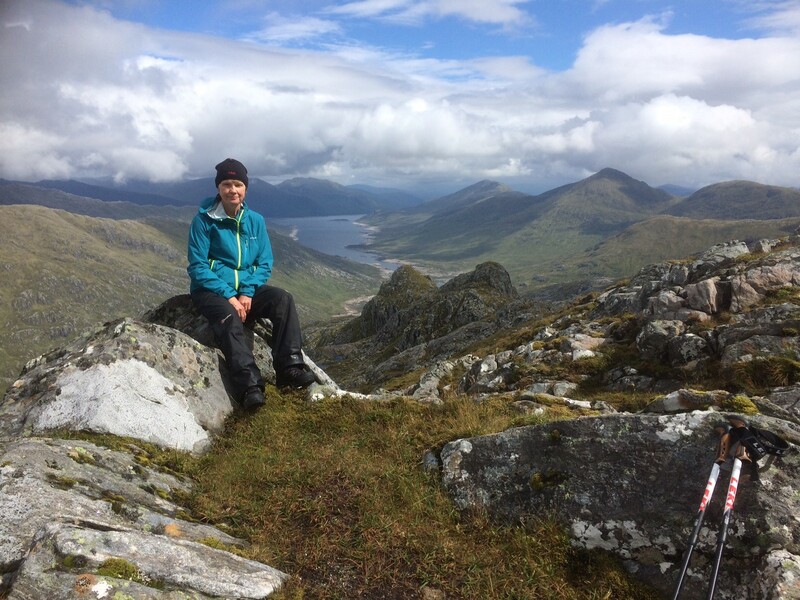 Carol: In all honesty, most of my injuries have been caused by sports rather than the Munros, squash seems to injure me more than walking does. An injury sustained recently playing sports is made worse by walking so I am having regular treatment on that. The clinic has a diverse range of therapists, treatments and strengthening classes available, which service have you found helped you the most with your preparations and recovery? Carol: I have been seeing Karen Dearden, Clinic Director, since the mid to late 1980’s. While I mostly come in for treatment, I am now starting to feel the benefits of maintenance treatment to help prevent injuries occurring. One time I had completed a long drive over the weekend and I had terrible pain in my foot, so much so that I couldn’t bear any weight on it. Karen squeezed me into her clinic and one the Wednesday I competed in a triathlon. I couldn’t have done that without Karen. I have regular physiotherapy for my injuries, sports massage as part of treatments and for maintenance, acupuncture helps my back pain from cycling and the podiatrists have helped with orthotics and heel pain over the years. We both feel the benefits from regularly practising Pilates and we attend classes at the clinic as often as possible, we both believe we will continue to practice Pilates as a lifelong activity. Do you have maintenance treatments such as massage between walks to help you prepare for the challenge ahead? Carol: I haven’t always but I do intend to increase my maintenance treatments as I can feel the benefit when I add massage to my training and treatment programs. If you could turn back the clock would you still take on the Munro and Corbetts challenges knowing now what would lie ahead of you? Carol and Vera have been friends for many years and this challenge strengthened their friendship. Vera: This challenge has been such an adventure. Carol: We have had so many laughs along the way, the good climbs make up for the bad. Vera: If we were to do it all again, we would make sure we didn’t leave the hardest climbs till last. Carol: Oh, and the more you visit Scotland the higher the chance of being there in nice weather! Do you have any advice for anyone thinking of taking on the challenge themselves? Carol: Learn to navigate properly, our experience has shown that you can’t rely on GPS. Vera: Seconded, map reading is key. Vera: Expect the worst and enjoy the good, you won’t be disappointed. What’s next for you both, are you going to step up to climbing the likes of Kilimanjaro or Everest or are you hanging up your walking boots? Carol and Vera have thoroughly enjoyed their Munro challenge. Carol: We’re not quite sure, there are so many options, the Grahams, the Donald’s, the County tops. I don’t think either of us are ready to hang up our walking boots just yet. Beautiful scenery kept them both motivated during tricky climbs. Vera: I quite fancy the Triangulation Pillars, we have come across some of these during the Munros and Corbetts, but it could be fun to do them as a challenge on their own. 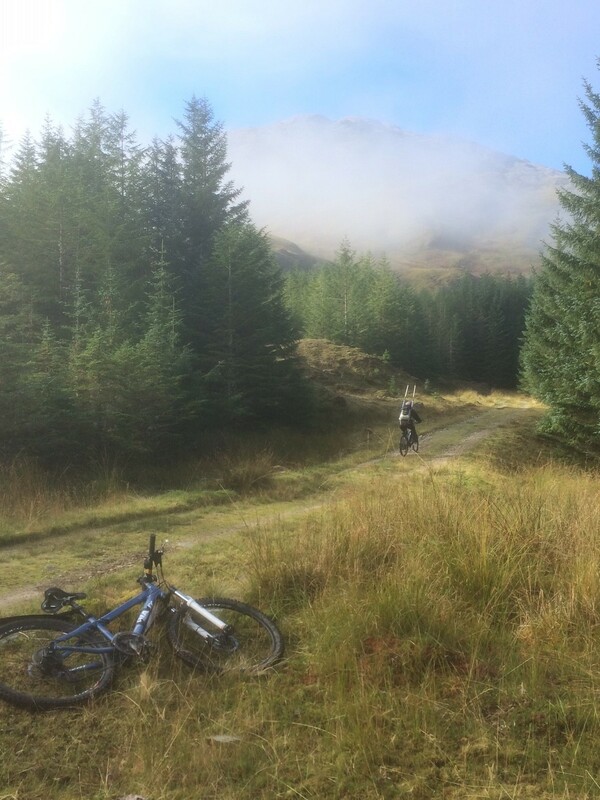 Question from Clinic Director, Karen Dearden – is there a Munro that you haven’t been injured on Vera? 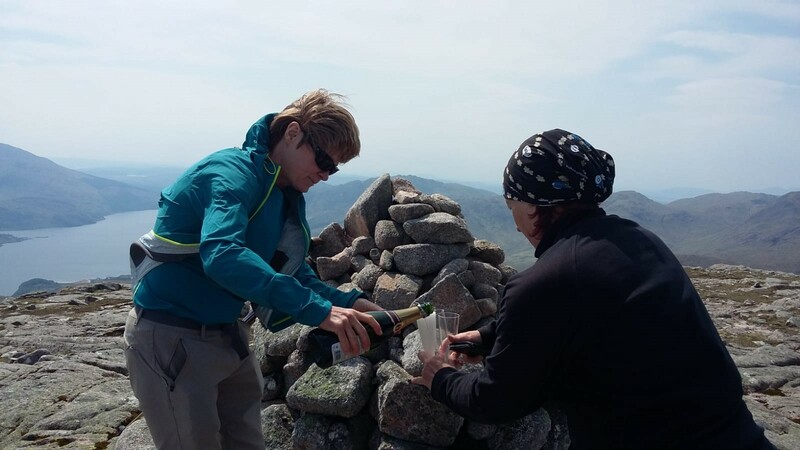 In the spring of 2018, Carol and Vera reached the top of their very last Munro and with a glass or two of bubbly, celebrated their newly earned status of Compleatist/Munroists. In 2018 Carol and Vera celebrated climbing their final Munro. The ladies are now Compleatist/Munroists! Congratulations ladies, that is quite an achievement that you must both be very proud of. 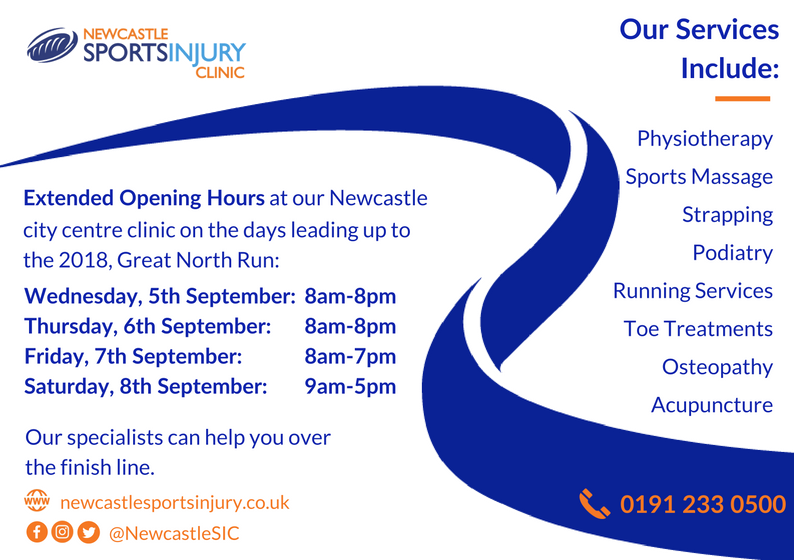 All of the therapists and support staff here at Newcastle Sports Injury Clinic would like to pass on our heartfelt congratulations and we all look forward to hearing more tales and tantrums from the challenges when you come into the clinic for your maintenance treatments. We can’t wait to hear what challenge you decide to take on next. 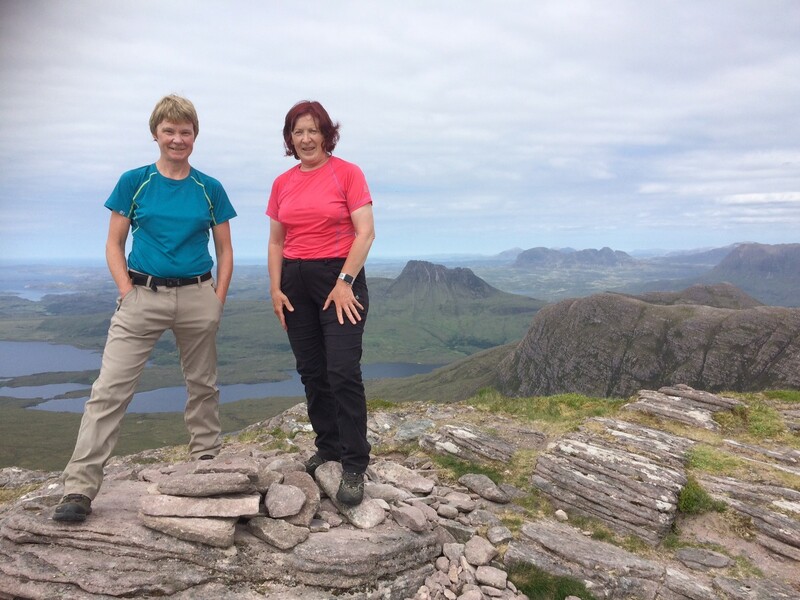 Thank you so much to Carol and Vera for sharing their Munro and Corbetts journey with us. If you have been inspired to take on the challenge yourself, you can find out more information here.